If you are a MacBook user, you might have considered upgrading its storage at some point of time — not just for storage upgrade, but sometimes as a performance boost option (by replacing the standard HDD with an SSD) as well. Unfortunately, Apple doesn’t encourage users to replace internal components at home, and don’t usually offer official support for after-purchase hardware upgrades. But you can turn to a few reliable third party manufacturers for alternative storage upgrade solutions for your Mac. In this article, we’ll explore a few of these storage upgrades. Depending on the specific model, your MacBook might be equipped with a storage disk ranging anywhere between 128 GB to 1 TB. Apart from capacity, MacBook drives also differ in technology. Most of the earlier MacBook models (before mid 2012) have standard rotational hard drives, while most of the post mid 2012 models (particularly the Retina ones) have SSDs (flash storage). Even for MacBooks based on flash storage, its implementation varies in different models. The first of the flash storage based MacBooks implemented SATA interfacing, which supports transfer speeds of up to 6 Gbits/s (in case of SATA III). Eventually, SATA-based SSDs were replaced with PCIe-based flash storage in later MacBook models, which supports faster data transfers (up to 25 Gbits/s in case of PCIe 3.0). Click on the Apple Logo on the top left corner >> About This Mac >> System Report >> Storage (under Hardware), and look at the Physical Volumes (or Physical Drive for some MacBook models) section. The Medium Type and Protocol attributes describe the type of internal storage implementation. Note: Before replacing your internal hard drive, you can consider backing up or cloning your original hard drive to the new one in order to make the upgrade process as seamless as possible. You can use OS X’s built-in Disk Utility software to clone your original hard drive. Most MacBook models introduced before mid-2012 implemented standard hard disk drives (HDD) for storage. If you see Medium Type as Rotational in the Storage section of your Mac’s System Report, it implies that your MacBook has a standard HDD. In that case, upgrading to an SSD can give you a significant performance boost. File write speeds on SSDs are about 4-5 times faster than conventional hard drives, while read speeds are also about 30% faster. Additionally, SSDs also consume less power, and hence more battery-friendly, compared to HDDs. Upgrading to SSD based storage from standard HDD is quite easy, as 2.5 inch SSDs of various capacities are readily available in the market. Many of the popular storage solution companies, including OWC, SanDisk, Kingston and even Samsung, manufacture SATA 2.5inch SSDs that can replace your original MacBook HDD. The below video explains the steps you need to follow in order to replace your older HDD with an SSD. Though the demonstration uses a Samsung SSD, it is applicable to all 2.5 inch SSDs. If System Report on your MacBook shows the Storage Medium Type as SSD, it already includes a flash based storage drive. Still, you can upgrade to a higher capacity SSD and use the original one as a secondary storage device with these options. If your MacBook’s System Report shows the Storage Medium Type as SSD and Protocol as SATA, it includes a SATA based flash storage module. Most of the 2012 – Early 2013 MacBook Pro models with Retina display uses this type of storage. Below are some of the storage upgrade solutions compatible with your Mac. JetDrive from Transcend is an SSD solution for MacBook models with SATA based flash storage. JetDrive SSD upgrades are available up to 960 GB of storage capacity depending on your MacBook model. It also claims to have faster read-write speeds compared to Apple’s factory installed SSDs on supported MacBook models. JetDrive comes with an additional external enclosure which keeps your original flash drive (the one that came with your MacBook unit) secure and usable. The sturdy aluminum case converts your original flash storage into a portable USB 3.0 compatible thumb drive. You also get a USB 3.0 cable, thus ensuring that you can get faster read-write experience of your existing flash drive, at least to some extent. So, instead of one SSD, now you have two high speed SSD flash drives — one installed on your Mac, and the other as a portable external drive. Transcend JetDrive includes a handy installation guide which gives you step by step instructions on how to install the JetFlash drive on your Mac and use the pre-installed SSD as a secondary device. If you are too lazy to read through the instructions, the following video also demonstrates the same thing. JetDrive is available in four different models with 240 GB, 480 GB and 960 GB variants. Most of the newer MacBook models use the PCIe based flash storage instead of the earlier SATA based MLC flash drives. 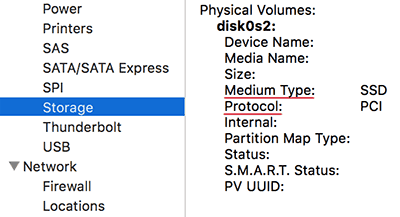 If System Report on your MacBook shows the Storage Medium Type as SSD and Protocol as PCI, it uses a PCIe based flash storage. Up until recently, storage upgrade for PCIe based flash was not possible. But earlier this month, Other World Computing (OWC) announced its exclusive line of PCIe based flash storage upgrades. Designed for the mid 2013 or later MacBook Pro (with Retina display) & MacBook Air, OWC introduced the first of its kind SSD upgrades for PCIe based flash storage. With 480 GB and 1 TB SSD variants, Aura SSDs provide up to 8 times the capacity of Apple’s factory SSDs. Apart from these, Aura SSDs are specifically designed to work reliably with your Mac. Below are some of the notable features of the Aura PCIe based flash drives. Tier-1 Flash: Aura SSDs use top quality flash for superior performance and reliability. Superior Error Correction: Aura SSDs provide three levels of error correction for improved reliability. Cell-Level Data Refresh: The SSD controller monitors data blocks and maintains correct charge at the cell level, hence improving data integrity and extending its lifespan. 7% Over Provisioning: Aura SSDs perform maintenance tasks in the background to optimize the health, performance and endurance of the flash drive. The drive reserves 7% of its overall capacity for carrying out these maintenance tasks. The Aura comes with a complete upgrade kit which includes the Aura SSD, the Envoy Pro (a USB 3.0 enclosure for your original factory installed SSD), a USB 3.0 connecting cable, a Pentalobe compatible screwdriver and a Torx T-5 screwdriver. The last two items in the kit can be used to remove and replace all the applicable screws needed to install the new flash drive. Additionally, you can also refer to free installation guides and videos that make your upgrade process simple and easy. If you simply want to extend the storage capacity of your MacBook with the help of external storage cards, you can explore a few of the solutions mentioned below. Keep in mind though, you might not get the same level of performance and speed boost as the Internal storage replacement solutions mentioned in the previous section. That being said, these external storage upgrades provide decent read-write speeds and are ideal for expanding the storage available on your Mac, particularly when you’re running out of free space. Transcend’s JetDrive Lite storage expansion cards are designed in such a manner that they fit seamlessly into the SD Card slot of your MacBook. Once inserted, the JetDrive Lite acts like any external storage device connected to your Mac, and you can use it to store your favorite media and documents. Alternatively, you can also use it as a backup drive for Time Machine backups. JetDrive Lite drives are built with high quality MLC flash and can achieve read speeds of up to 95 MB/s and write speeds of up to 60 MB/s. Practically though, read-write speeds might vary a little from the officially mentioned values based on several factors, which includes the particular JetDrive Lite variant you’re using. JetDrive Lite comes in four different variants with storage capacities ranging from 64 GB to 256 GB. If you’re looking for a cheap solution for upgrading your MacBook storage, you might want to check out external microSD card adapters such as Nifty MiniDrive Pro. These adapters are handy if you have a microSD card with decent storage capacity (64 GB or 128 GB) at your disposal. Unlike usual SD cards or microSD adapters that stick out of your MacBook’s SD Card slot, the MiniDrive slides into the slot without any part sticking out. The adapter also includes an accessory for removing the card from your MacBook. There are similar products from different companies, each of which comes in different variants based on specific MacBook models. So, before purchasing the product, do ensure that the variant you’re buying is designed for your MacBook model. Non compatible models might not fit properly into your MacBook’s SD Card slot, which in turn may affect its performance or even cause damage to the product or your MacBook. If you don’t mind plugging in an external drive in order to expand your available storage, external Solid State Drives are also a good option. A host of companies manufacture external SSDs of different storage capacities; the 256 GB, 500 GB and 1TB variants being the most common. In order to utilize your SSD up to its full potential, ensure that the SSD either uses Thunderbolt (which supports data transfer speeds up to 20 GB/s) and/or USB 3.0 (which supports data transfer speeds up to 5 GB/s) interface. Most external SSDs usually record maximum read-write speeds at around 450-500 MB/s, which is much lower than the maximum read-write speed supported by USB 3.0/3.1 and Thunderbolt interfaces. Practically though, Thunderbolt powered drives are generally found to perform better compared to USB 3.0/3.1 drives. You can choose from a number of external SSD options available in the market. Few examples of Thunderbolt and USB 3.0/3.1 based external SSDs include Transcend 2 TB Thunderbolt USB 3.0 External drive and LaCie Rugged 1 TB Thunderbolt USB 3.0 External drive. However, we suggest you to explore these products on the Internet to determine which one suits you best. Now that you are aware of the various SSD storage upgrades available, you can pick any of them according to what suits your requirement. Which one of these solutions would you go for? Let us know in the comments below. Why is 32GB iPhone 7 slower than its higher capacity models?